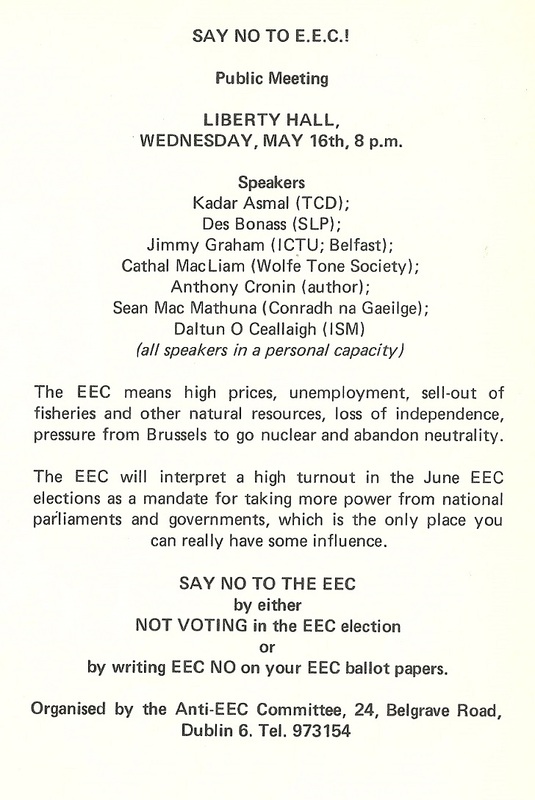 From May 1979 a flyer advertising a meeting “Say No To EEC!” organised by The Anti-EEC Committee urging a boycott or a spoiling of Ballot papers in the European Elections due to take place in June 1979. Among those addressing the meeting were Kadar Asmal, Des Bonass (SLP),Jimmy Graham, Daltun O’Ceallaigh and writer ANthony Cronin. From the 1979 Local Elections campaign a flyer for Socialist Labour Party candidates in Artane, Bert Bennett, Jim Maher, Dave Neligan and Máirín Breheny. Also some notepaper from the campaign with a message from then Socialist Labour Party TD Noel Browne. Another leaflet from that campaign is posted here. 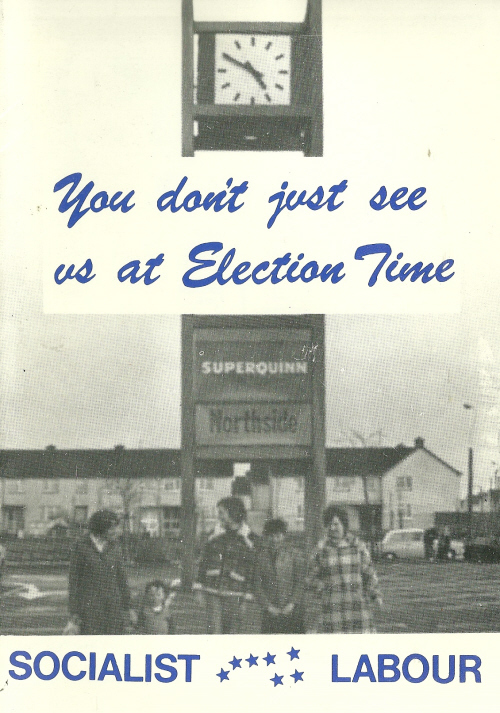 From the 1979 Local Elections a leaflet from The Socialist Labour Party for Bert Bennett, Máirín Breheny, Jim Maher and Dr. Dave Neligan who were running in Artane. In the leaflet there are profiles of the candidates , a message from Noel Browne and policies of the Socialist Labour Party. In the Election Bert Bennett polled 923 votes and missed on the last seat by 223 votes. Jim Maher polled 788 , David Neligan polled 689 whilst Máirín Breheny polled 448. Was given these photos by someone who had been involved with the Socialist Labour Party (Many thanks). Given that Browne was such an important and influential figure in Irish Politics I thought I’d post them. The first picture is from the 1979 Local Election Campaign of Socialist Labour Party candidates in the Artane / Coolock ward. 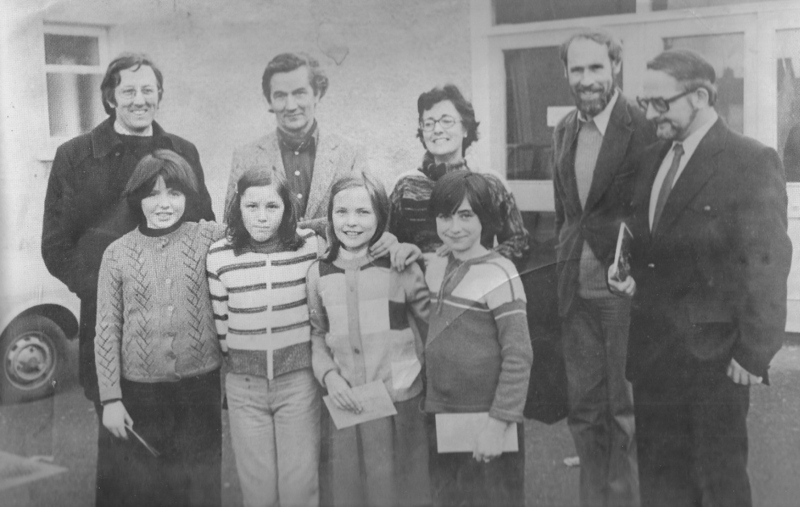 Pictured with Noel Browne are four children and the candidates Jim Maher, Mairin Breheny, Bert Bennett and David Neligan. Neligan was a political assistant to Dr.Noel Browne from 1968 to 1982. Bert Bennett polled 923 votes and missed on the last seat by 223 votes. Jim Maher polled 788 , David Neligan polled 689 whilst Mairin Breheny polled 448. A simple flyer from Noel Brownes Socialist Labour Party that was sent to me.